Alex Carrigan is a recent college grad hailing from Newport News, Virginia. Growing up, Alex was very much drawn to media, spending a lot of time reading books and watching television and movies. As he got older, Alex began to spend more time researching media and learning more about the various books, shows, and films he was exposed to. In high school, Alex began to take a turn more towards his future goals. He took classes on studying film and creative writing and became more interested in the fields. He was accepted to Virginia Commonwealth University in 2010 and moved to Richmond, Virginia to attend the school. At VCU, Alex received a major in print/online journalism and a minor in world cinema. While his interests and career plans changed radically in college, Alex did discover that he wants to live a life engaged in artistic passions, where he could meet and engage with creative individuals and write about them. It was in this time that Alex decided to try and merging his interests, using his degrees in order to try and work for an arts publication or publishing group. Alex first got a taste for the literary scene when he joined a literary journal called Poictesme in 2010. In Poictesme, Alex got to read poetry and prose submitted by students, critique them, then help create an annual publication showing the best of VCU student art and literature. He stuck with the group all through his college career, even obtaining the rank of deputy editor-in-chief from 2012-2014. Because of changes within Poictesme, Alex and the editor got to go to AWP 2014 in Seattle in order to promote Poictesme, attend panels, and prowl the book fair. It was at the book fair that Alex met Cambridge Writers Workshop and passed along his resume. The rest is history. Alex is excited to be the new Editorial and PR intern for Cambridge. He hopes to help promote the group online and assist in the various projects of the group. He can also be followed on his blog at carriganak.wordpress.com. 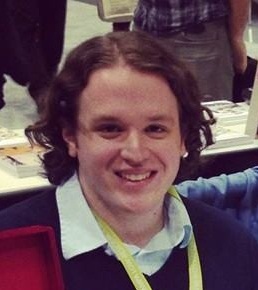 He also can be followed on Twitter @carriganak and his Facebook page “Alex K. Carrigan, Journalist.” He is also the staff film reviewer for Quail Bell Magazine and has articles published regularly there. This entry was tagged intern. Bookmark the permalink.